Schematic showing the mechanisms that contribute to the interannual variability of spring season stratosphere-to-troposphere ozone transport over the western United States: (a) the strength of the Brewer-Dobson circulation (depicted by the thick green arrows) that controls the winter season buildup of ozone in the lower stratospheric reservoir that serves as the source of ozone available for stratosphere-to-troposphere transport, and (b, c) north-south shifts in Pacific Basin storm track patterns (depicted by thick blue arrows) that govern the frequency and location of stratosphere-to-troposphere transport. Various types of low-frequency variability modulate stratosphere-to-troposphere transport via these mechanisms; examples include variations in the Northern Annular mode that modulate the Brewer-Dobson circulation shown in (a) and typical El Niño and La Niña jet shifts shown in (b) and (c) for 1992 and 1999, respectively. Determining the concentrations of ozone over North America that would exist in the absence of any human-caused ozone precursor emissions continues to be a puzzling problem for researchers, in part because of difficulties associated with accurately accounting for non-local, naturally occurring sources of ozone. One significant non-local source of tropospheric ozone over western North America is the “folding” of stratospheric air downward into the troposphere (stratospheric intrusions). However, a conclusive accounting of the relative influence of stratospheric versus tropospheric contributions to the strength and frequency of stratospheric ozone intrusions has to date remained elusive. In a new study to be published in the Journal of Geophysical Research — Atmospheres, scientists from the Earth System Research Laboratory, CIRES, and their collaborators analyzed factors governing the strength and frequency of stratospheric ozone intrusions over the western United States on interannual timescales. The researchers found that the amount of ozone in the lowermost stratosphere at the end of winter is a strong indicator of the amount of ozone that will be contained in stratospheric intrusions during the ensuing spring. Additionally, they showed that the overall strength of the winter season stratospheric circulation system, measured by the Northern annular mode index, is a useful predictor of ozone intrusion strength. 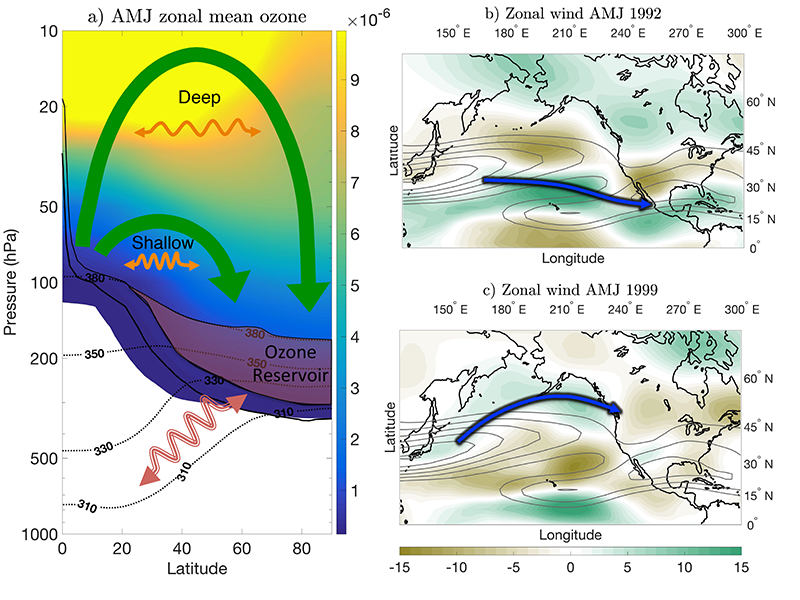 The results also suggested a nuanced relationship between the phase of the El Niño Southern Oscillation (ENSO) and stratosphere-to-troposphere ozone transport. They found that while ENSO-related variations in the jet stream are associated with ozone transport variability, it is the frequency of planetary wave breaking rather than the location of stratospheric intrusions that is responsible for the ENSO-ozone transport relationship. Stratospheric intrusions can lead to high levels of surface ozone, which has strong negative impacts on human health. A better understanding of the factors that influence the frequency and strength of stratospheric ozone intrusions will allow a more accurate determination of the tropospheric ozone budget and improve seasonal and long-term surface ozone prediction. Authors of Mechanisms governing interannual variability of stratosphere to troposphere ozone transport are: John Albers, Judith Perlwitz, George Kiladis, Amy Butler, Andrew Langford, and Juliana Dias of ESRL, Thomas Birner of Colorado State University, and Zachary Lawrence and Gloria Manney of New Mexico Institute of Mining and Technology.